ICY BOX has been a presence in the external enclosure market since 2003, but their parent company RaidSonic has also been a significant player in external storage since their founding in 1999. The Hamburg-based manufacturer cater to both enterprise level requirements - through their RaidSonic brand - and the consumer and SOHO market segments through ICY BOX. As strange as it sounds, this led to a huge diversity in products considering the relatively simple set of requirements which appear at face value. 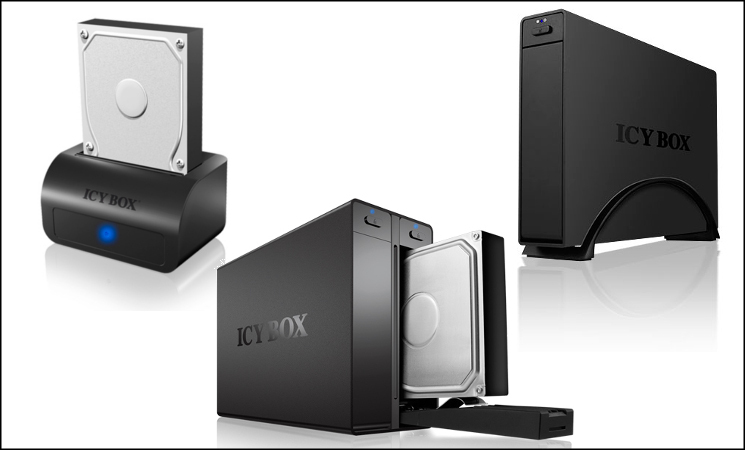 The current line-up of ICYBOX products alone includes Network Addressed Storage, USB JBOD enclosure, Smartphone accessories and even multimedia entertainment devices. Icy Box are also well aware that in order to appeal to a wider range of users their products need to be both highly functional and aesthetically pleasing. To that end designs have been created which include brushed aluminium exteriors, fashionably coloured cases, leather pouches or ruggedised reinforcement. Although the products we're reviewing today are some of the more standard in this regard, Icy Box have an enclosure to suit almost any need. You will have noted that today we're reviewing three different enclosures, encompassing two slightly different market requirements. The IB-116StU3-B uses an external docking station style which has become popular in more recent years, primarily intended for hot-swapping 2.5" and 3.5" drives. By contrast the IB-366StU3+B and IB-3662U3 are robust external enclosures for more long-term holding and transporting of disk drives on a desk and between workplace and home. The IB-366StU3+B in particular is noteworthy thanks to its support for UASP, the latest improvements to the USB protocols for improved performance. All three utilise USB 3.0 as their method of high-speed data transfer, but unlike some USB3.0 enclosures they all support SATA III 6Gbps drives at above SATA II speeds.